The Twitter streets were busy on Monday after an eventful weekend and a day that gave people a lot to talk about. Monday was a busy day on the Twitter streets, with celebrities making the trends list for different reasons. AKA hosted a successful concert when he performed with a 30 piece orchestra at the Sun Arena at Time Square in Pretoria on Sunday. The concert was praised by many, who also called him a “musical genius”. Though he trended for his successful concert, he was also the talk of the Twitter streets after sparking romance rumours following a picture of him and DJ Zinhle circulating on social media. DJ Zinhle trended shortly after. She attended the concert, along with AKA’s mother, Lynn Forbes, Nomuzi Mabena, and Lerato Kganyago. Pictures of the two kissing set tongues wagging and started speculations that they may have rekindled their romance. However, some dragged DJ Zinhle for forgiving a man who once took to social media to humiliate her in several posts in defence of then girlfriend Bonang Matheba, who also dominated the trends list. Though Bonang’s name always comes up whenever DJ Zinhle and AKA are mentioned, she mostly trended because of her new endeavour, which saw many taking to social media to send messages of congratulations. Bonang officially launched a Méthode Cap Classique (MCC) today titled House of BNG, which is South Africa’s equivalent of champagne. “Welcome to the House of BNG… two years in the making and my love letter to Africa! I introduce my brand new Brut & Brut Rosè MCCs…. it’s time to celebrate,” said the TV personality. Bonang will also be a guest on the Fresh Breakfast show for the first time tomorrow to speak in detail about her latest move. She was also on the cover of Cosmopolitan magazine. ….a boss, babe!! ???? Here’s to rewriting the rules!! The April 2019 issue of @cosmopolitansa South Africa hits newsstands TOMORROW, March 18th!! ???????????????? Thank you for the honour…???????? ???????? (Shot on location: In my house! Lol!) #CosmoxBonang #BossBabeIssue #HouseOfBNG ???????????? Monday was also labelled as the day of reconciliation after the picture of AKA and DJ Zinhle, and of Somizi Mhlongo at the launch of Bonang’s champagne. Which one is your best reunion? The two had a friendship that was the envy of many for years, but fell out shortly after Bonang got into a relationship with AKA. Somizi said at the time he did not know why Bonang had decided to cut him out of her life, and the mystery went on until she finally revealed in her book that she had decided to end the friendship after learning of Somizi’s apparent friendship with DJ Euphonik, whose relationship with her also ended on a bad note. It seems the two reconciled, hence he attended the launch and Bonang’s first interview with DJ Fresh and Somizi on Metro FM. However, social media users could not help but wonder what happened to Lorna Maseko and Bonang’s friendship following her apparent no-show at the event, and her absence from Bonang’s recent Instagram posts. Lorna trended for a while. 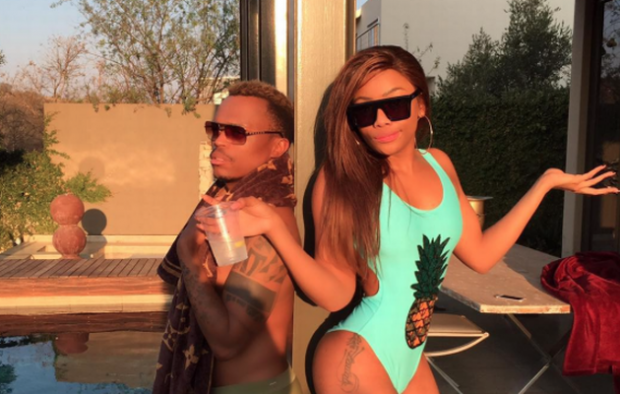 Lorna is out, Somizi is back in? ???? The two used to hang out together and go on trips together, but that seems to have ended. Rachel Kolisi and her husband also decided to join the trends list later in the day after her attempt to track down a woman who allegedly sent Siya an explicit image.